«Latvia’s joining of NATO (North Atlantic Treaty Organisation) fifteen years ago was the most important event for our country since the restoration of independence. Today we are stronger than we’ve ever been. Together with our National Armed Forces our allies – NATO member states – stand guarding our country’s security,» says Latvia’s President Raimonds Vējonis. The president says in the 21st century the world has faced many complex threats and challenges. It is possible to avert those threats and overcome challenges only by working together and strengthening NATO and EU defensive initiatives. At the same time, it is equally important to continue work to ensure NATO member states are able to oppose traditional and hybrid threats. 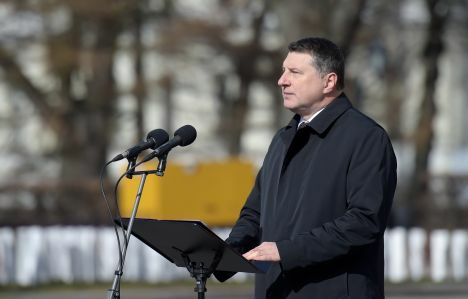 Celebrating the 15th anniversary of Latvia joining NATO, a festive guard change was carried out at Riga Castle in the morning on 29 March 2019. NATO flag was also raised above Riga Castle’s Tower of the Holy Spirit. Events were attended by Commander of Mechanized Infantry Brigade Lieutenant Colonel Sandris Gaugers, Lieutenant Colonel Philippe Sauvé, Commander of the Battle Group for NATO Extended Presence in Latvia, as well as NATO battle group representatives from Albania, Czech Republic, Italy, Canada, Poland, Slovakia, Slovenia and Spain and US military attaché in Latvia. 29 March 2019 marked fifteen years since Latvia and other countries had submitted documents to Washington and joined NATO. 4 April will mark 70 years of NATO’s existence. This means 2019 represents an anniversary in NATO not just for Latvia but the entire alliance as well. «Since restoring independence, Latvia has wanted to establish footing in the space of Euro-Atlantic values and security. We have accomplished this! This year we are celebrating fifteen years of membership. Latvia is an active and trustworthy NATO ally. We fulfil our duties to the letter. As a NATO member state, Latvia participates in decision-making process on the highest level, and this directly affects Latvia’s security,» said Latvia’s Foreign Affairs Minister Edgars Rinkēvičs.